Judith Fredricks continues to bring Opera New York, her small but very artistic company, to new venues. 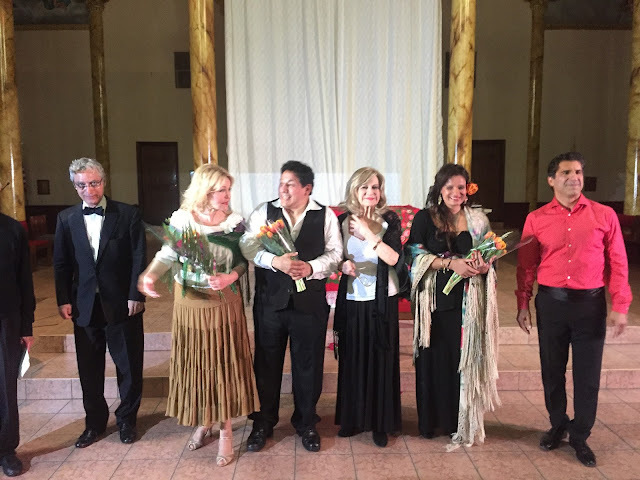 To the Sacred Heart Church in the heart of Hell's Kitchen, she has brought plenty of heart to a new audience that thronged the church for an evening of Latin American song and French opera. The capstone of the evening was a performance of all the memorable arias and duets written by Georges Bizet for Carmen, his 1875 masterpiece, which debuted at the Opera Comique. All the spoken dialogue of the original was omitted and Judith Fredricks herself narrated the story with Spanish translation provided by a charming bilingual young woman -- all for the advantage of the Spanish speaking members of the congregation. This was a fine idea, keeping the evening to a length and intensity that would draw in people who were unfamiliar with the opera but would have recognized the major numbers. The other fine idea was to have the singers costume themselves in a fashion that was suggestive of the time and place and to act out their roles. "Park and bark" never won any converts! Ms. Fredricks has assembled a core group of singers that have dramatic chops as well as vocal artistry. Soprano Veronica Loiacono has all the right stuff for Carmen and showed the gypsy's seductive, manipulative, and defiantly headstrong character. This wouldn't be the first time we heard a soprano tackle this role, usually consigned to a mezzo-soprano. She was missing nothing in the "Habanera" and the "Seguidilla". She was able to show different aspects of her personality when she beguiled Don Jose and when she related to Escamillo. As Micaela, the gentle country girl Don Jose is supposed to marry, soprano Elena Heimur left nothing to be desired. Her duet with Don Jose was tender and moving. The way she steeled her character in the mountain scene "Je dis que rien ne m'epouvante" was impressive. We loved seeing how tenor Edgar Jaramillo has expanded his emotional range beyond Mr.Nice Guy and he handled Don Jose's outburst of rage toward Escamillo in a violent confrontation that had us holding our breath. Similarly we felt right along with him as he pleaded with Carmen in the final scene and then stabbed her, cradling her body and showing his remorse. His vocal colors have expanded in tandem with his emotional range. He demonstrated just how besotted he'd become toward Carmen in the aria "La fleur que tu m'avais jetee". As Escamillo, baritone Roberto Borgatti has also shown a great deal of vocal growth and did justice to the "Toreador Song" which had the audience enthralled. It must be difficult for such a modest artist to don the mantle (in this case, a cape) of arrogance but that's what good acting is all about. We suspect that Ms. Fredricks herself was responsible for directing and staging, although there was no printed program. Michael Pilafian accompanied on the piano and played the score brilliantly and powerfully. As an added bonus there was a seasoned flamenco dancer twirling his cape and performing the vibrant footwork that let us know that we were indeed in Seville. There was also a lovely parade of songs in Spanish which seemed just right for Cinco de Mayo and the mostly Latin American audience. Mr. Borgatti gave a full throated rendition of "Amapola", a popular song from a century ago. He also joined Ms. Loiacono for an Argentine tango--Carlos Gardel's "El dia que me quieras". Ms. Loiacono hails from Argentina herself; she was just as fine in her duet with Mr. Jaramillo--"El Gato Montes" from the 1916 zarzuela by Manuel Moreno Penella. The work achieved great popularity in Spain and also in el Nuevo Mundo. The harmonies were lovely and there was passion to spare. She also had a lovely solo in Maria Grever's "Jurame". So many lovely songs have come from Mexico! Ms. Heimur offered the lovely "Estrellita" which was written by Manuel Ponce a century ago; it is often considered a folk song perhaps because Mr. Ponce failed to copyright it. In any case, this lovelorn lady wishing upon a star is charming in both text and melody. We particularly enjoyed "La rosa y el sauce", the sad tale of a willow who loved a rose which was picked by a girl, leaving the willow to weep. The song was written by Argentinian composer Carlos Guastavino and beautifully sung by Ms. Heimur. The final song in this group was the bitter "No puede ser" from Pablo Sorozabal's wonderful 1936 zarzuela La Taberna del Puerto. Mr. Jaramillo once again expanded his vocal artistry and dramatic reach. It was wonderful to witness a new audience come to a church on a Friday night and have such a fine time. The response was enthusiastic. This is not the only company to do outreach in neighborhoods but we always appreciate the creation of new audiences. The Sacred Heart Church provides a fine home for Opera New York with its beautiful cavernous space and lively acoustics. We suspect this audience will return for more.